This post is part of the Ask an SEO copywriter series. We have said before that SEO copywriting is simply good copywriting, and this is true even when it comes to writing links in web pages on your own website or others. Web copywriters are a special breed. Not only must we understand our customers’ businesses and their audiences, but we must also understand technology, search engines, and how people use computers. Writing links to your pages is an important part of being a web copywriter, and knowing what makes for good SEO is what separates the great from the average. Links to your website from other sites (called ‘backlinks’) are hopefully being written by someone else: a blogger, a reviewer, or even a customer. With these links, you don’t have too much control, but the power of backlinks in SEO terms is immense. Where you have control over your links, for example those you post on social media sites, comments, and other pages where you have some say, it’s important to get your keywords into your links. Good: Get some great will writing tips from the Legal Example Company. Bad: Click here to get tips on writing your will. Which link do you think has more SEO benefit? The one with keywords ‘will writing’ or the one with ‘click here’? Writing ‘click here’ is not only boring and fairly useless as a link, it’s also unhelpful to your readers. Because it says nothing about what lies beyond the link. Hyperlinks are like little doors that we use to get from one ‘room’ to the next. When you focus on what is behind the door, you are helping people. An example I often use in web writing courses is to imagine approaching the office of the corporate CEO. His or her door has a title (CEO) and often a name. This information indicates what (or in this case whom) is behind the door. The protocols and technology of operating the door (knock before entering, turn the handle, push the door open) are assumed. It is a guarantee that by the time someone has switched on a computer, loaded a web browser, typed in some website and navigated to your link, they know how to click links. You don’t need to focus on the technology. You don’t need to tell them how to operate (click) the link. When you focus on what’s behind the ‘door’ you are being a good copywriter. 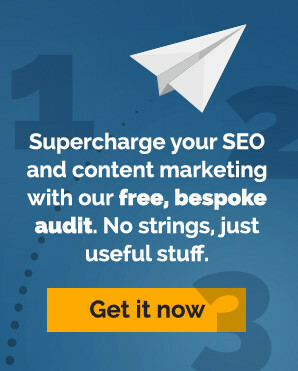 You are indicating to the reader what is beyond the link, and funny enough by doing so, you are using your SEO keywords. SEO copywriting is good copywriting. Focus on what is behind the link, not on how to use the link. Use your primary keywords for the target page in your link. Coming next in the SEO copywriter series: How do I use keywords with video? I agree with you from the SEO perspective – there’s no point in hyperlinking ‘click here’ when you can link on on a relevant phrase. But from the user point of view, ‘click here’ can be handy – and sometimes will get you a better click through rate, especially at the end of a sentence. So while I agree ‘Click here to get tips on writing your will’ isn’t much good, I wouldn’t rule out ‘To get tips on writing your will, click here’.